Happy collecting on this first day of trap deployment! Several of you have been tweeting and blogging pictures and we are so glad that you have found the perfect locations for your Malaise traps! We encourage you and your class to take a « #SMTPselfie » with your trap as well as tell us about the weather in your area! Don’t forget to start filling out the « Collection Records Spreadsheet« , as you will need to submit this document to us at the end of the program (hard or electronic copy). We are approaching trap deployment; Sept. 21st is just around the corner! Please remember to set up your trap and have the first collection bottle ready to go on Monday morning (Sept. 21). We encourage you to set up your trap tomorrow so that come Monday morning, all you will have to do is screw in the week 1 bottle and make trap observations (store bottle lid in a place you will remember!). Recall that we ask you to let us know at the end of the first week how your trap is doing. We will send out another reminder, but please send us an email indicating your catch volume on Friday, Sept. 26th. Please have your collection bottles and Malaise trap packed and ready to be sent via FedEx on Monday, Oct. 5th. Please arrange a package pick-up time with FedEx for this date. Further details will follow. Don’t forget to keep up the great blogging work! 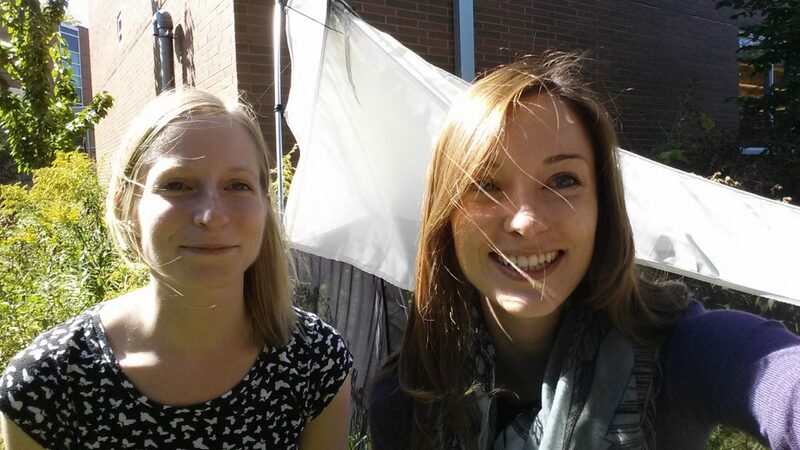 We encourage you and your class to take a picture with your Malaise trap (#SMTPselfie) once it has been set up as well as tell us about your schoolyard habitats. Please feel free to blog, tweet, or add these pictures/comments to our FaceBook page. If there are any questions please let us know. We are here to assist you at every step along the way and there will be more reminder emails to come! 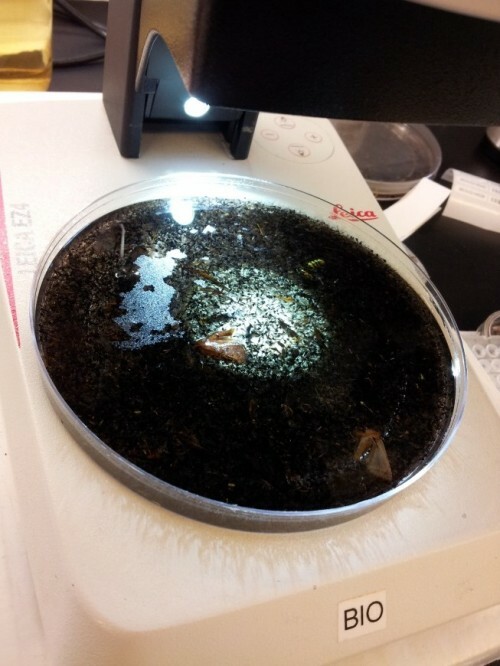 #SMTPselfie – Share your Malaise Trap Selfie and your class could win a prize!! Once again, the School Malaise Trap Program team is continuing one of their favorite program trends…taking a selfie with the Malaise trap! We encourage all classes to participate and post your #SMTPselfie on our blog or tweet at us (@SMTP_Canada). You can also email us your selfie and we will post it on your behalf. Once a class has submitted their selfie, they will be entered into a draw for one of our prizes (yes, you can enter more than one selfie!)! Further contest/prize details to come. Check out our #SMTPselfie below! CONGRATULATIONS TO OUR 2015 FALL SCHOOL MALAISE TRAP PROGRAM PARTICIPANTS! 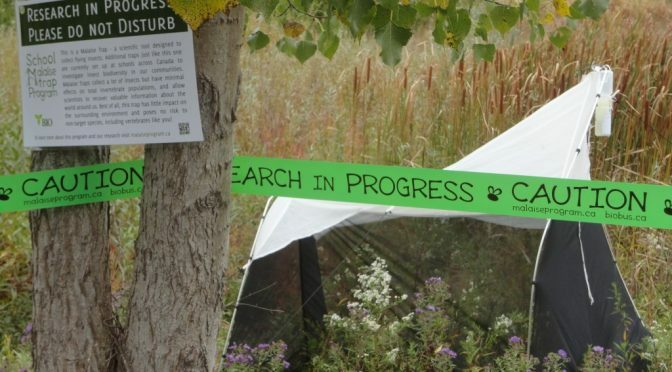 Thank you to all who applied for this Fall’s 2015 version of the School Malaise Trap Program! This version, we received an overwhelming amount of applicants to the program (~ 150 schools) from across Canada. We are thrilled with this response, and it is because of your continued enthusiasm and support of the program that we have become so successful. We are pleased to announce the following 64 sites have been accepted into the 2015 Spring School Malaise Trap Program. Congratulations to all! 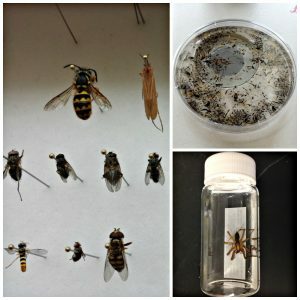 Week 2: Virtual Tours & Insect Trapping Methods! 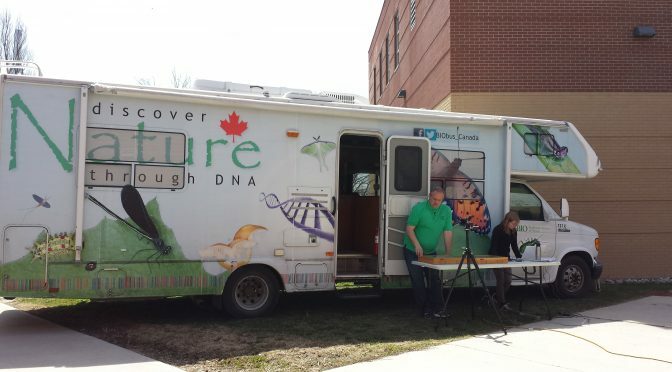 This week, BIO has been hosting live virtual tours of our BIObus (our field research vehicle). During these tours students have been learning about different insect trapping methods, insect orders, and have had the chance to interact with our expert! 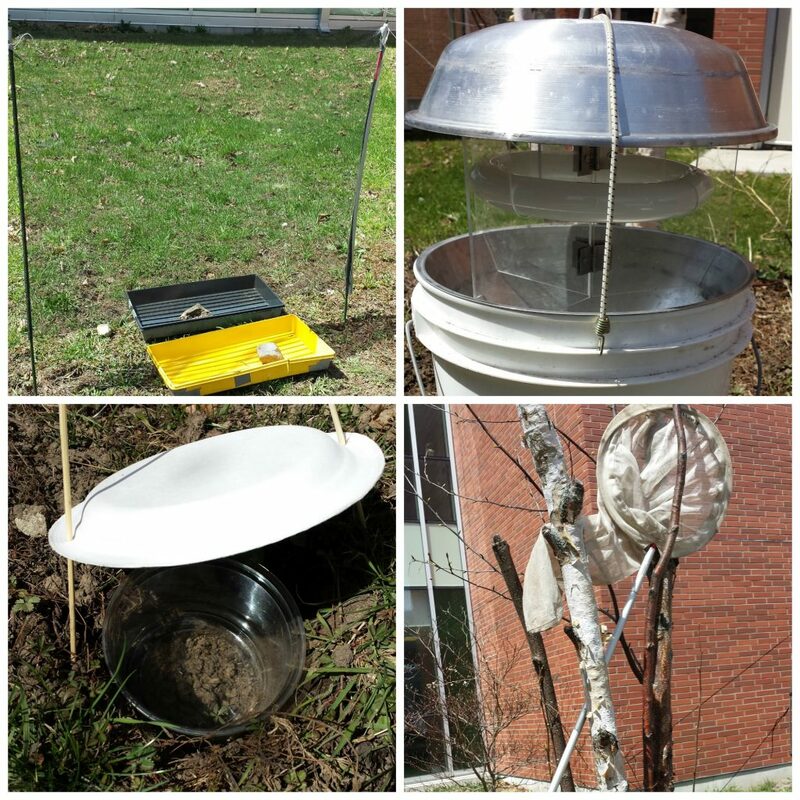 Can you name the insect trapping methods pictured below? BIO has also been collecting specimens this week. Check out our week 2 bottle below! BIO Has Set Up Their Malaise Trap! 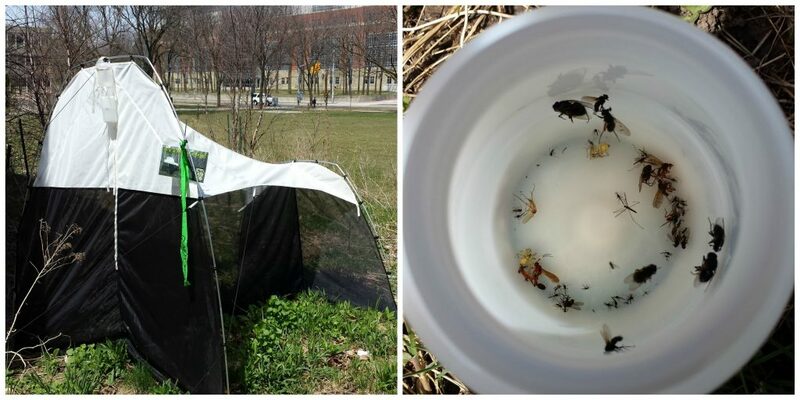 We’ve had some lovely weather here in Guelph, ON over the past week and we thought that this would be a good time to set up our Malaise trap here at BIO which we use for spring/summer/fall educational programming! You can already see that the attached ethanol bottle (see the dark and cloudy areas) has collected a few insects (mostly flies). However, there are more than just flies out there! 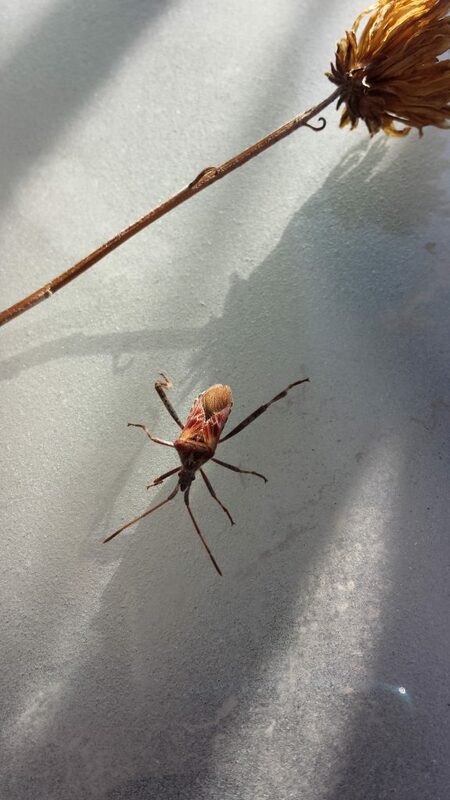 Over the weekend, one of our E&O team members spotted a Leaf-footed bug on her balcony. Reminder: Trap deployment is Monday, April 20th. Now would be a great time to finalize the location of your Malaise Trap. You may also wish to set up your Malaise trap on Friday, April 17th so that come Monday morning, all you will have to do is screw in the week 1 ethanol bottle and make trap observations. We look forward to seeing what you collect! Workshop: It’s a Malaise Trap! Outdoor educators have always known that insects are amazing classroom study organisms! They are easy to collect and have a fascinating array of life histories. Insects are also important indicators of ecosystem health and are an integral part of every park, schoolyard and habitat surrounding us. Come enhance your knowledge of the world of insects with us at the Biodiversity Institute of Ontario (BIO)! 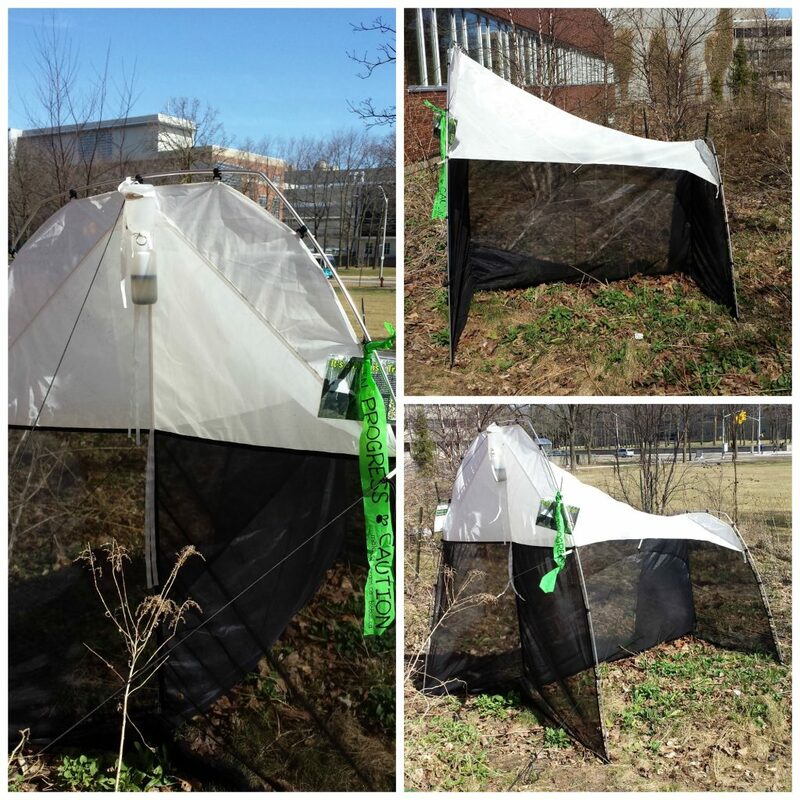 This workshop is specially designed to teach outdoor educators about the Malaise trap, a tent-like apparatus used for the collection of flying insects, as well as insect identification, classification, and DNA barcoding through hands-on activities and professional training. Biodiversity has become exceedingly important in our changing world and BIO’s experts will provide all of the necessary tools required for enhancing your outdoor education programs through the scientific exploration of insects and inquiry-based activities. Furthermore, participants will be introduced to specialized public programs offered by the Biodiversity Institute of Ontario and will receive several resources to take home. The Biodiversity Institute of Ontario at the University of Guelph is an institute dedicated to the study of biodiversity, particularly at the species level. BIO is also the birthplace of DNA barcoding, whereby short, standardized gene sequences are used to accelerate species discovery and identification. BIO is home to several world-class biodiversity experts and entomologists who are eager to share their knowledge with you! Happy Halloween from everyone at BIO!! Happy Halloween from everyone at BIO! 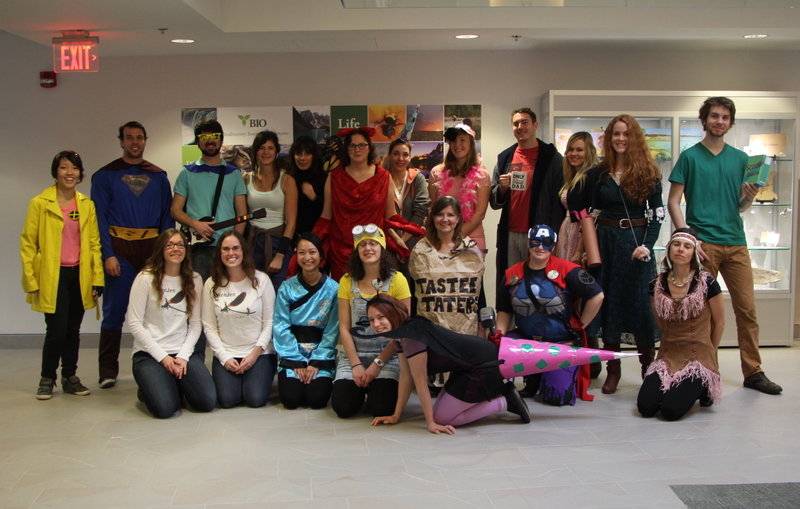 It may have been a cold and rainy day here in Guelph, but that definitely did not dampen our Halloween spirit!